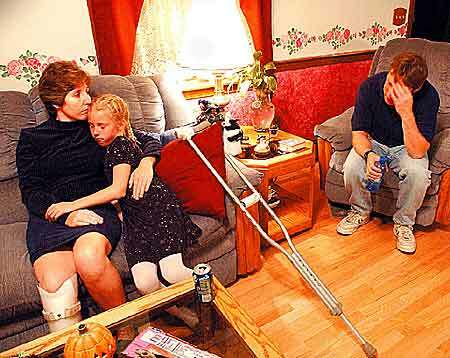 Nancy Quintin, left, cuddling her daughter, Jordan, 9, chats with her husband, Eric. Nancy Quintin suffers chronic pain from injuries suffered when hit by a drunken driver three years ago. She can no longer work. Click here or on thumbnail above to enlarge graphic on the cost of drunk driving. The drunken driving crash that left Nancy Quintin permanently disabled has cost her family far more than health or accident insurance covers. Her husband, Eric Quintin, estimates the family has spent $45,000 on child care alone since his wife's accident. Co-payments on the eight medicines she takes range from $20 to $35 each. The family spent $10,000 installing a therapeutic whirlpool and at least $7,000 on other devices not covered by insurance. With Nancy Quintin, a pediatric nurse, unable to work, the family is down to one income and Eric Quintin's health insurance, which is critical to their financial survival. He literally cannot afford to lose his job, a nerve-wracking prospect in a tough economy. "If I lose my job, we're in trouble," he said. One stunner for the Quintins was how little they will be able to collect from the insurer of the car that hit her. The drunken driver who hit Quintin died in the crash. The owner of the car had only the minimum required bodily injury coverage: $20,000 for each person injured or $40,000 total for if more than one person were hurt. The Quintins had purchased additional coverage to increase their limit to $50,000 per person and $100,000 per accident. Because of the way insurance regulations work, the Quintins cannot collect the combined amount of the policies. And the other insurer has already paid out some money to two victims in a third car involved in the accident. The most the Quintins can collect is $100,000, the limit of their policy. Because of rising medical costs, experts recommend $100,000 to $300,000 per person. "It seems to me the rule of thumb is to carry enough insurance to protect yourself, and if not, you're on the road at your own risk," said Scott Lang, a New Bedford attorney who is representing the Quintins. Nancy Quintin and her four children didn't die when a drunken driver plowed head-on into their minivan on an early August evening in 2000. In that respect, they are luckier than the driver who hit them. Adrian O'Connor, a 26-year-old recently arrived from Ireland, was driving his girlfriend's car. There was a 30-pack of beer in the car and an open can next to O'Connor when police found him dead in the front seat. While fatalities may represent the ultimate cost of drunken driving, the body count misses the physical, emotional and financial toll on those who survive, and the harm to society. Federal studies estimate that drunken driving costs the United States $114 billion a year in medical expenses, lost wages and decreased quality of life. Massachusetts' share of that bill is $1.8 billion. The statistics obscure a compound tragedy experienced by many victims and families: often the auto insurance carried by the drunken driver, or by the victims, is totally inadequate to cover the costs. Repeat offenders who have lost their license may have no insurance at all, forcing victims to rely only on their own. In any case, victims sometimes face years of litigation to recoup some of their costs. Outwardly, Quintin seems to be doing well for a woman who survived the force of a crash equivalent to slamming into a brick wall at 100 mph. 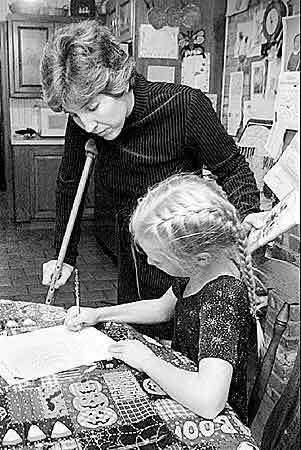 Nancy Quintin helps her daughter, Jordan, with her math homework while her husband, Eric, prepares dinner for the family. Nancy Quintin rarely cooks or eats meals with her family because of her pain. Despite the 14 surgeries she has undergone, the brace on her right leg and the crutch she needs to get around, she could easily pass for younger than 37. She and her husband, Eric, and their children still live in the roomy two-story house they bought in Raynham 10 yars ago. But now, fatigue sometimes forces Quintin to crawl up the stairs to her bedroom - when she has the energy to get out of bed at all. Sons Luke, 5, and Shay, 6, and daughters Chandler, 8 and Jordan, 9, all recovered from their injuries and are active and exuberant. Even with their baby sitter in the house, they go to their mother with their questions, hurts and triumphs. Quintin, who was once an athlete, can no longer run around after them. She still faces the prospect of losing her leg, which has refractured several times since the accident and is susceptible to bone infections. She worries about the potential for addiction to the narcotics she takes to dull her constant leg and back pain. When Eric Quintin returns from his job at an engineering company, he makes dinner, a task now too arduous for his wife. The girls frequently take charge of the laundry and often bring their mother dinner in bed. Quintin doesn't believe she will ever come home from work again. She still misses her job as a pediatric nurse at Children's Hospital in Boston, a career she loved for 11 years and lost in an instant. "I worked so hard to become a nurse, and I feel it was taken away from me," she said . Not only did Quintin lose a source of tremendous personal satisfaction, but her family lost her salary, most likely forever. Nurses in Massachusetts earn an average of $60,000 a year, more if they specialize, says the Massachusetts Nurses Association. A conservative estimate of her lost wages, assuming she would have retired at 65, is $1.86 million. That doesn't include Eric Quintin's lost wages whenever he exhausts his vacation and sick days, as he has for the past three years, to take her to doctor visits. Nancy Quintin receives disability payments from Social Security worth about $1,500 a month. But those benefits cost the government, and Quintin's exit from the work force means the government also loses her income tax contribution. The National Highway Traffic Safety Administration assigns a value of $67,000 to the quality of life lost by a drunken driving injury in Massachusetts. For the Quintins, the reality of that loss far exceeds her medical bills. The family has not taken a vacation since the accident. Quintin feels her bonds with her children were strained by her time away from them in the hospital. With her fatigue and pain, she feels she is letting them down. The children seem to have adjusted to their mother's limitations. Polite but energetic, they stop their play now and then to cuddle with her on the couch. But for Quintin, it's not enough. "You feel tremendous guilt because you never feel like you're being a good mother," she said. Julie Jette may be reached via E-mail by .